You may require prosthodontic treatment if you have lost teeth or your natural teeth have been damaged by decay or trauma. Prosthodontics is concerned with restoring and revitalising your teeth to improve appearance and dental function. At Broseley Dental Practice, we recognise the need for long-lasting and dependable dental restorations. Losing your teeth can feel worrisome and cause problems when eating and interacting with others. This field of dentistry can, therefore, help you to look and feel better about your teeth. 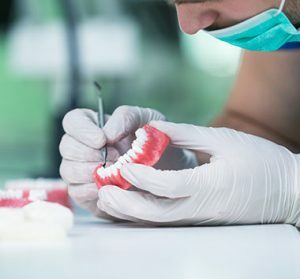 Prosthodontics is an advanced form of dental treatment which focuses on you as an individual and provide a solution for your missing or damaged teeth. It is important to replace lost teeth as quickly as possible to avoid problems with eating and chewing as well as future problems such as deterioration of the jaw bone. We offer patients a thorough and bespoke treatment plan to meet their dental needs.